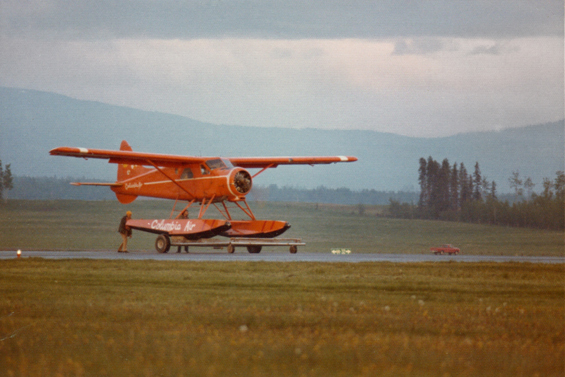 C-FYOI at Vanderhoof, British Columbia. CF-YOI dolly take off at Prince George, BC. 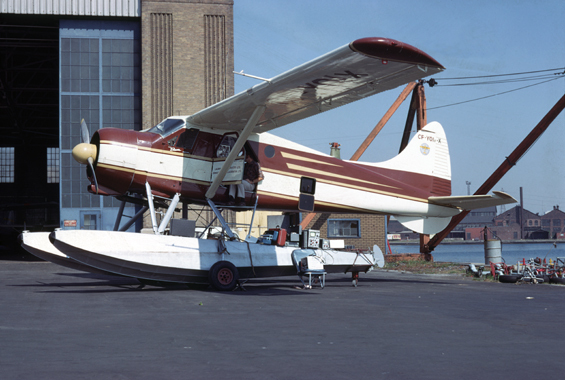 CF-YOI-X of Laurentian at Toronto Island Airport. Strange aerial and appendage on this survey aircraft. VH-AAV at Wagga Wagga - YSWG, NSW. A95-203 wrecked by gales, 28 December 1959. A95-203 with A95-201 in the Prince Charles Mountains. A95-203 shows off ski gear. 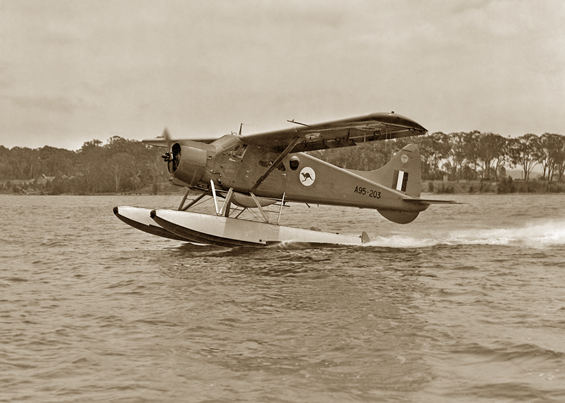 A95-203 training on Lake Macquarie. The Australian sport of Beaver wrestling. Particitpants: Pilots Flt. Lt. H.G. Wilson (left) and Sdr. Ldr. Ian Grove (right) with Sgt. Manning front of port float and Sgt. Richardson at rear. Unknown airman at starboard float. 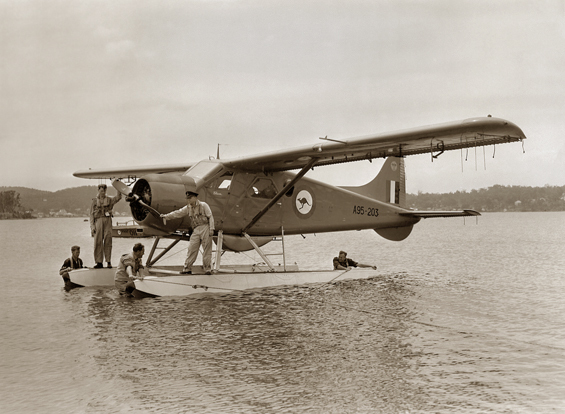 Photos: © Courtesy of Aviation Heritage Museum of Western Australia. A95-203 posing for the camera. • Delivered to Hawker de Havilland Australia 24-Jun-1957. • A95-203 RAAF Antarctic Flight in support of Australian National Antarctic Research Flight (A.N.A.R.E). Delivered 23-Sep-1956. Note: Delivered in overall International Orange scheme and reported with Day-Glo panels on outer wings, rear fuselage, leading edge of tail fin and on tail planes. It wore the Bounding kangaroo fuselage marks and “D” type wing roundels, fin flash, DH logo above it and white “Beaver” marks in script on both pilot doors. The following notes are extracted from the book written by David Wilson, “Alfresco Flight, the RAAF Antarctic Experience”. Details of specific flights are mentioned where details are known but the aircraft flew many other sorties on reconnaissance, photographic and depot support flights as well”. The notes highlight the problems encountered by both the flight and ground crews in the tough environment. 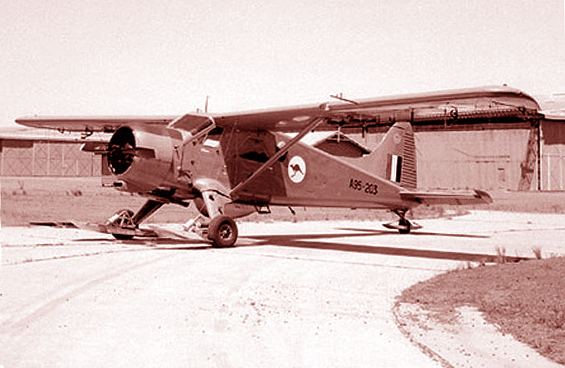 The aircraft was embarked on MV Thala Dan leaving Melbourne on 03-Jan-1958. The flight crew were Ivan Groves, H.O. Wilson, S.A. Manning, G.K. Downer, A.K. Richardson & O. Maquire. The ship arrived at Lewis Islet on 11-Jan-1958 where a weather station was established. It then moved east down the Antarctic coast on the route to Davis Depot, but was impaired by ice. A reconnaissance flight was carried out which resulted in the ship having to steer a reciprocal course out. A round trip flight of 240 miles was made to the American base at Wilkes on 28-Jan to collect an Australian observer back to the ship, but low cloud and glare made it difficult to find the route. The Americans vectored him in by radar. However on the return flight a wind change of 270 degrees blew the aircraft a long way off course however the Davis radio beacon was used to guide the aircraft back although landing in the near dark provided a difficult sea landing. The ship arrived at Davis on 04-Feb-1958 and the aircraft completed a flight to the Vestfold Hills and back. The ship arrived at Mawson on 10-Feb and an extension to the Hanger was commenced and improved radio communication mast was erected. 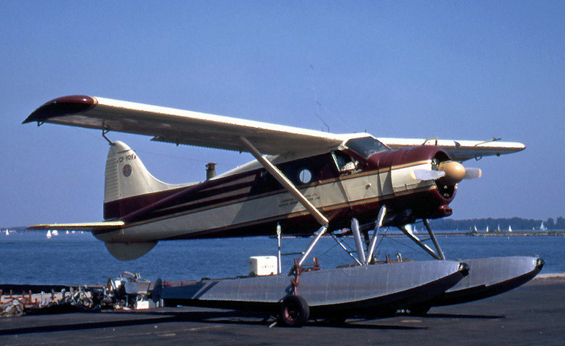 A95-203 was converted from floats to ski wheel combination. Blizzards and failing light in Apr & May-1958 reduced the flying effort and the first major flight was not made until 17 Jul-1958 when a reconnaissance was made to the King Edward VIII Gulf to open the spring programme. Later the aircraft flew flights to the Masson and David Ranges to locate landing sites for the summer operations. On 15 Aug Grove with Manning and McLeod commenced a flight to Davis but strong winds and complete cloud cover forced a return to Mawson. However the oil pressure gauge dropped to zero and grove turned towards the sea but the mechanical condition of the aircraft meant that he had to land in a heavily crevassed area of sloping ice about 800 yds inland, eight miles west of Scullin Monolith. 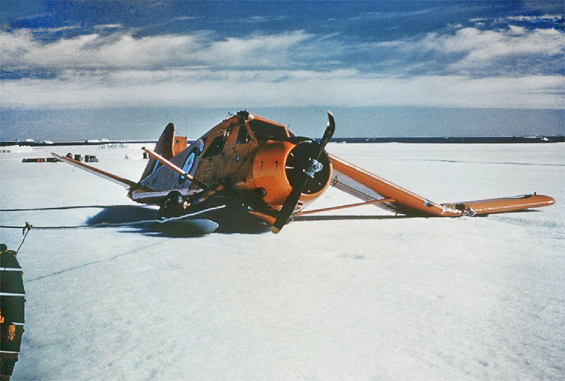 The aircraft was sliding downhill and only kept still with the engine running until it was secured safely on the ice. The men erected a tent to overnight in and A95-202 piloted by Wilson with engineer Richardson landed close by the next day and took Manning and McLeod back to Mawson. The two men remaining worked on the engine and stayed another night in uncomfortable conditions on the ice. Wilson returned the next day and after a discussion Grove decided to attempt to fly back to Mawson. It arrived back at Mawson safely, just. Richardson completed the engine change by 23-Aug 1958. 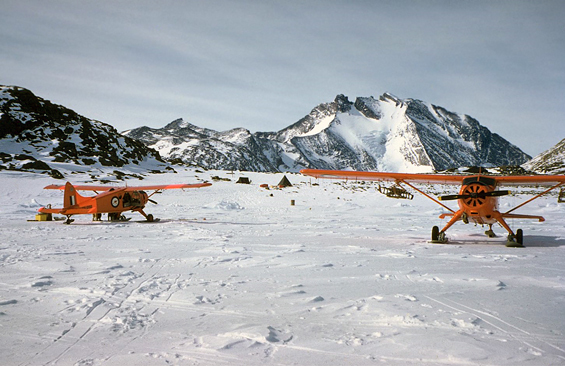 On 12-Sep the aircraft was involved in the establishment of fuel depots in the Ygarden group and later in the month the establishment of a sled route from Amundsen Bay to Mawson, a distance of some 400 miles and flights to the Taylor Glacier. 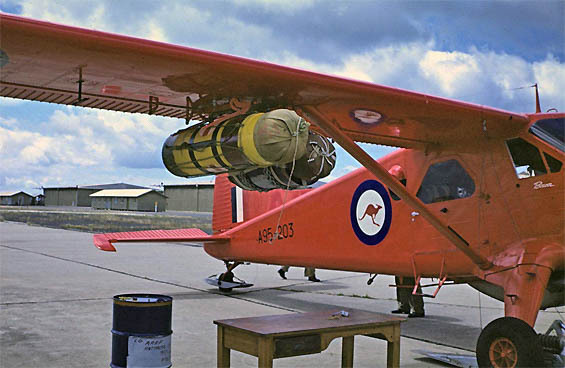 On 10-Dec 1958, Wilson was making a normal approach to land at Mawson when he entered severe turbulence and a 1,500 ft per minute sustained climb was indicated while attempting to descend with the throttle fully closed. 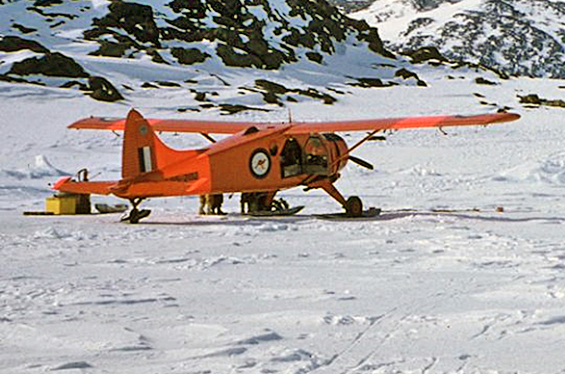 The director of the Antarctic Division requested that the aircraft be base above Mawson on the plateau as the condition of the ice at the base in summer caused handling problems around the hanger and he felt that the value of continued flying through the summer months justified the risk of leaving the aircraft in the open. The considered reply was that experience showed that in overload conditions the aircraft could not sustain numerous landing and take-offs from rough plateau ice. The suggestion was to use larger twin engine aircraft. The Director reluctantly agreed but the seed was sown for the provision of a Dakota. 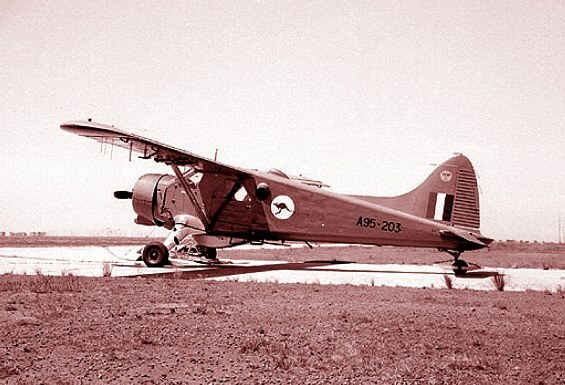 In early Apr-1959, A95-203 was tethered down on the plateau behind Mawson for four days between flights no doubt as a trial for the deployment of the aircraft onto the plateau for the summer season Due to the weathering the engine had to be hand cranked to start. In the winter during early July one of the engineers was found collapsed in the hanger under the aircraft with carbon monoxide poisoning. He had been running the engine inside and the outside blizzard had built up snowdrifts and caused the hanger to be virtually airtight. During a blizzard lasting from 27-30-Jul 1959 the spare floats and cradles were smashed against the wind fence. Contact had been lost for several days from the Taylor Glacier party that had been dropped off on 18-Jun and A95-203 was dispatched to find the reason. On arrival at the site there was just a blackened mark on the surface where the sleeping hut had been, but now burnt out. The party were found just in their clothing as worn. The weather for the flight was terrible and the fact that it happened at all was a tribute to the ground and flight crews. It was then involved in supporting the scientific teams but because of the poor weather the aircraft only completed flights on eight days of September. On 27-Oct whiteout conditions caused the aircraft with A95-201 to land near Crooked Island 120 miles from Mawson, and had to remain on the ground until the morning of 29-Oct when conditions improved, the crew living on army rations. On 03-Nov the aircraft was caught in a crosswind gust and the wingtip was damaged and as the cargo was unloaded it was also found that the starboard aileron was fouled. This was freed but subsequent repairs at Mawson took until 11-Nov.
On 22-Nov a faulty polar compass and inadequate maps caused the crew to be uncertain of their position. It managed to return safely but with very little fuel in its tanks. Parts from A95-201 & 203 were used to rebuild one aircraft receiving A95-203’s c/n 1052. 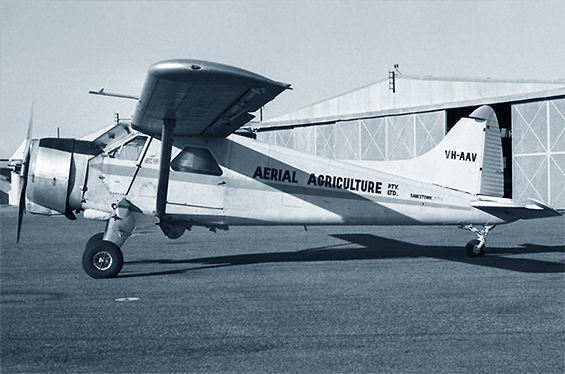 • VH-AAV Aerial Agriculture Ltd., Bankstown, NSW. Sep-1962. Entries preceded by date are extracts from Department of Transport files held at Archive Canada. 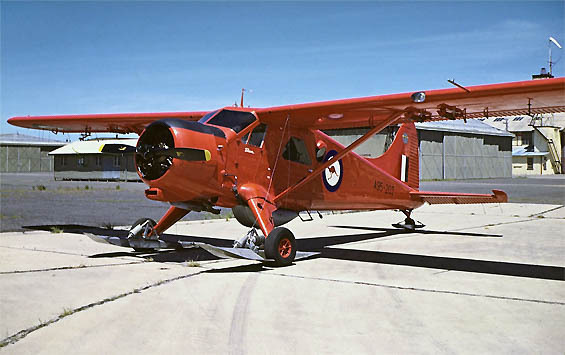 27-Mar-1969 Allotment of Registration CF-YOI DHC-2 c/n 1052 for Laurentian Air Services. 27-Mar-1969 One month Certificate of Registration and Flight Permit for Importation Flight to Laurentian Air Services, Oxnard, CA to Ottawa. 12-May-1969 Certificate of Airworthiness issued. 18-Jun-1969 Application for Certificate of Registration by Laurentian Air Services Ltd., Ottawa, ON. 25-Jun-1969 Certificate of Registration issued to Laurentian Air Services Ltd., Ottawa, ON. • N1590 P. .J. Murray, Oxnard, CA. • CF-YOI Laurentian Air Services Ltd., Ottawa, ON. Regd 25-Jun-1969. • CF-YOI-X Leased by Barringer Research Ltd., Toronto, ON. Note: Anthony R. Barringer (1925-2009) was a pioneer in the geophysical industry. He made numerous contributions to the development of exploration technology, both in Canada and abroad. His most noteworthy contribution was the development of the INPUT (Induced Pulse Transient) airborne electromagnetic (EM) system. This technology became the premier fixed-wing airborne survey system, and has been credited in the discovery of more than 25 commercial ore deposits with a combined value of tens of billions of dollars. 12-May-1971 Certificate of Transfer of Ownership; Laurentian Air Services to Taylor Lake Air Services Ltd., Prince George, BC. 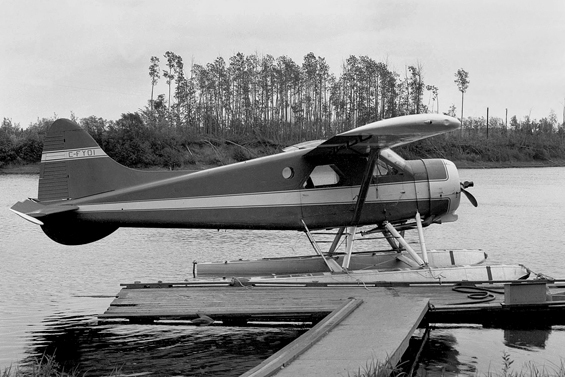 —Jun-1971 Application for Certificate of Registration by Taylor Lake Air Services Ltd., Prince George, BC. 13-Jun-1971 Certificate of Registration issued to Taylor Lake Air Services Ltd, Prince George, BC. 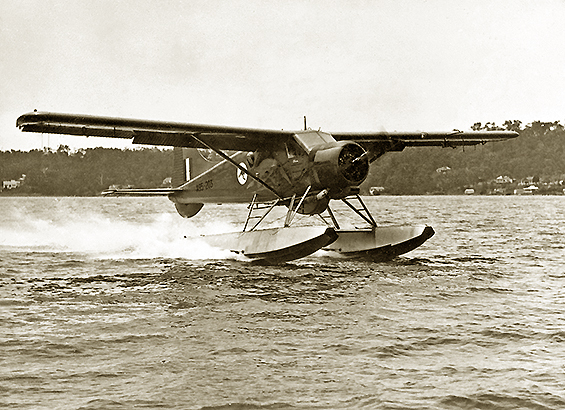 • CF-YOI Taylor Lake Air Services Ltd., Prince George, BC. Regd 13-Jun-1971. 15-Jun-1971 Application for Certificate of Registration by Columbia Airlines Ltd., Prince George, BC. 18-Jun-1971 Temporary Certificate of Registration to Columbia Airlines Ltd., Prince George, BC. 18-Jun-1971 Certificate of Registration issued to Columbia Airlines Ltd., (under lease from Taylor Lake Air Services). 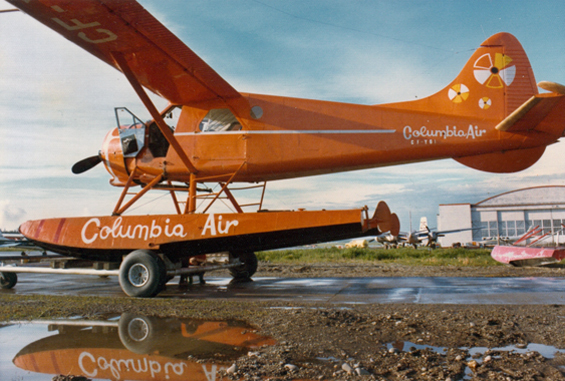 • CF-YOI Columbia Airlines, Prince George, BC. Regd prior to Certificate of Airworthiness renewal dated 12-May-1972. 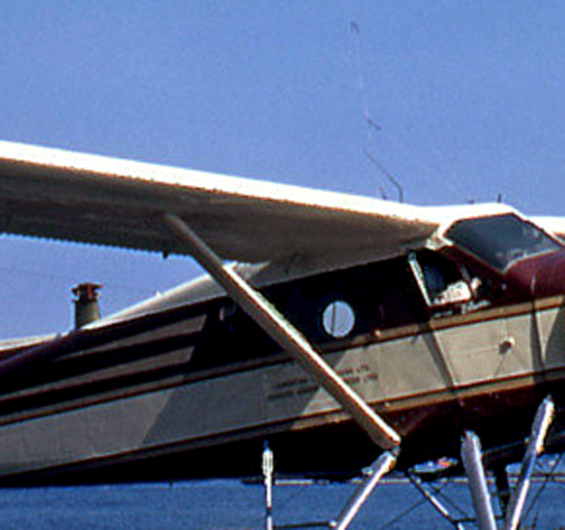 Canx prior to Certificate of Airworthiness pre 19-Jun-1976. 18-Jun-1975 Application for Certificate of Registration by Wolverine Airlines Inc., Fort St James BC. 04-Jul-1975 Certificate of Registration issued to Wolverine Airlines Inc., Fort St James, BC. • CF-YOI Wolverine Airlines Ltd., Fort St. James, BC. Regd prior to Certificate of Airworthiness renewal dated 19-Jun-1976. 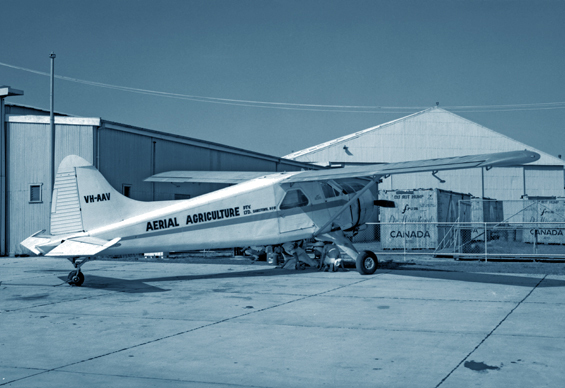 Canx prior to Certificate of Airworthiness renewal dated 19-Jun-1977. 20-Feb-1976 Certificate of Registration re-issued to reflect name change to Wildwood Airlines Inc.
• CF-YOI Wildwood Airlines Inc., Fort St James, BC. Regd 20-Feb-1976. 18-Jun-1976 Application for Certificate of Registration by Canyon Airways Ltd., Quesnel, BC. 25-Jun-1976 Certificate of Registration issued to Canyon Airways Ltd (under lease from Wildwood Airlines Inc). 04-Aug-1976 Lease to Canyon Airways terminated. • CF-YOI Leased to Canyon Airways Ltd., Quesnel, BC. 25-Jun-1976. Lease terminated 04-Aug-1976. 25-Apr-1977 Application for Certificate of Registration by 108 Mile Airways Ltd., 100 Mile House, BC. 20-Jun-1977 Certificate of Registration issued to 108 Mile Airways Ltd (under lease from Wilfred J. Leboe). Note: Detail of sale to Wilfred J. Leboe missing from archive file. • C-FYOI 108 Mile Airways, 100 Mile House, BC. Regd prior to Certificate of Airworthiness renewal dated 19-Jun-1978. Canx date currently unknown. 03-Mar-1979 Certificate of Transfer of Ownership; to Kluane Wilderness Lodge, Whitehorse, YT. (lease from W.J. Leboe). 10-Aug-1979 Certificate of Registration issued to Kluane Wilderness Lodge, Whitehorse, YT. 15-Aug-1979 Application for Certificate of Registration by Kluane Wilderness Lodge, Whitehorse, YT. 03-Jan-1980 Certificate of Transfer of Ownership; Kluane Wilderness Lodge to Vanderhoof Flying Services Ltd., Vanderhoof, BC. 03-Jan-1980 Application for Certificate of Registration by Vanderhoof Flying Service Ltd., Vanderhoof, BC. 23-Jan-1980 Certificate of Registration issued to Vanderhoof Flying Service Ltd., Vanderhoof, BC. 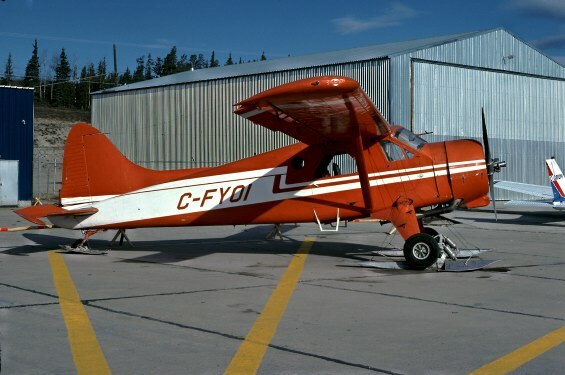 • C-FYOI Vanderhoof Flying Services Ltd., Vanderhoof, BC. Regd 23-Jan-1980. Removed from register 02-May-1985. Incident: Nechako River, BC. 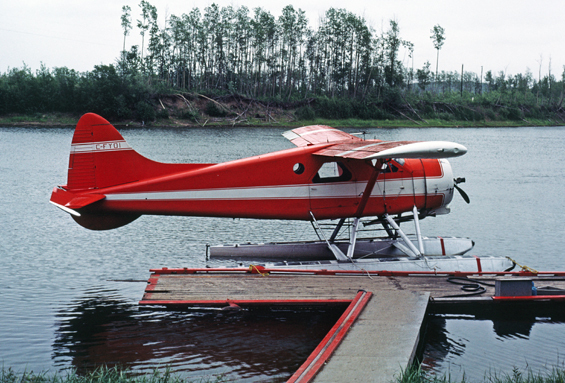 03-Jul-1983 Aircraft booby-trapped and owner, John Kluber, killed on entering aircraft as it drifted away on the Nechako River. Details via Transport Canada files: “At 10:00 A.M. 3 July, 1983 C-FYOI (c/n 1052) was destroyed by a bomb, killing the pilot and one person in a boat along side of the aircraft. This is still an open homicide file with the Prince George B.C. RCMP Detachment. The aircraft was destroyed and consumed by fire after the blast”. • C-GECT Pacific Aircraft Salvage, Vancouver, BC. Regd 11-Dec-1998. Canx 25-Jan-1999 as exported to USA but see below. • C-GFCO John Hill, Richmond, BC. Temp cert of regn. 07-Jun-1999. Canx 16-Jul-1999 on export to USA. 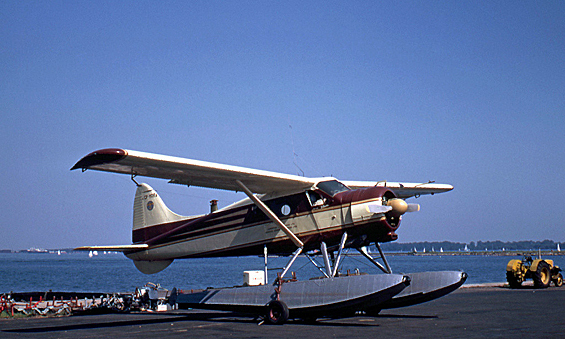 • N94TP Douglas Aviation Ltd., South Barrington, Illinois. De regd 19-Nov-2002 and then canx 14-Jun-2004 as per FAA registry.